MidiCi Franchise serves authentic Neapolitan pizza as the most delicious excuse for people to get together. People love pizza, they love personalization, and they love quality. But even more than that, they love spending time with one another. We’ve created an entirely new segment — fast-fine dining — that marries the best of fast-casual with highly polished and experiential fine dining. It’s something that doesn’t easily fit into established boxes — something new, and something making waves in the franchise industry. The demand for pizza is huge. Americans spend $46 billion a year on away-from-home pizza. On average, we eat 23 pounds of pizza every year, and 93% of Americans eat pizza at least once a month. The build-your-own pizza concept has become popular because it offers a compelling deal for guests and for business owners. Guests get to order a pizza that is just for them, so there’s no need to negotiate over toppings. The pizzas are the perfect size for one person. Business owners relish the opportunity to own a fun business where it’s possible to earn more revenue per diner. 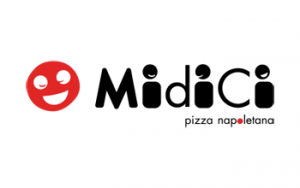 Why Open a MidiCi Franchise? While we compete against fast-casual pizza franchises, we offer food and ambiance that are closer to what you would expect from fine dining. We consider ourselves fast-fine — combining the quality and polish of a destination establishment with the speed and relaxation of fast-casual. MidiCi’s fast-fine pizza franchise is different and special, because our leadership team took great care to make us that way. MidiCi provides start-up and ongoing support to franchisees, including 4-6 weeks initial training, 10 days of opening support, PR and Grand Opening support, ongoing field visits, and ongoing franchisor support from our team at Global Headquarters. As a MidiCi The Neapolitan Pizza Company franchisee, having some pre-existing management and business experience, as well as some food background, is helpful but not required. Helpful skills include management of personnel, guest service and bookkeeping. Are you ready to grab your slice of success? Learn more now about franchise partnership with MidiCi by requesting information below.